Posted September 10th, 2018 by Media Heroes. For many years, cycling to work has received a bit of a bad rap. People seem to associate early morning exercise with sweatiness and exhaustion. But that’s simply not the case! Early morning is the time to exercise, and it’s certainly the best time to cycle. And thankfully, more and more people are coming around to this view and cycling to work. There are so many good reasons to cycle to work, and if you try it they will all become apparent. Still on the fence? Take a look at these compelling reasons to cycle to work – they’ll surely convince you! Cycling and fitness go hand in hand. In fact, cycling is one of the best cardiac and muscle building sports on offer. So it’s no surprise that our first reason to cycle to work is all about fitness. You don’t have to go flat out and arrive at work exhausted either. Even a light cycle, with no hills or challenges, will have an amazing effect on your physical fitness. 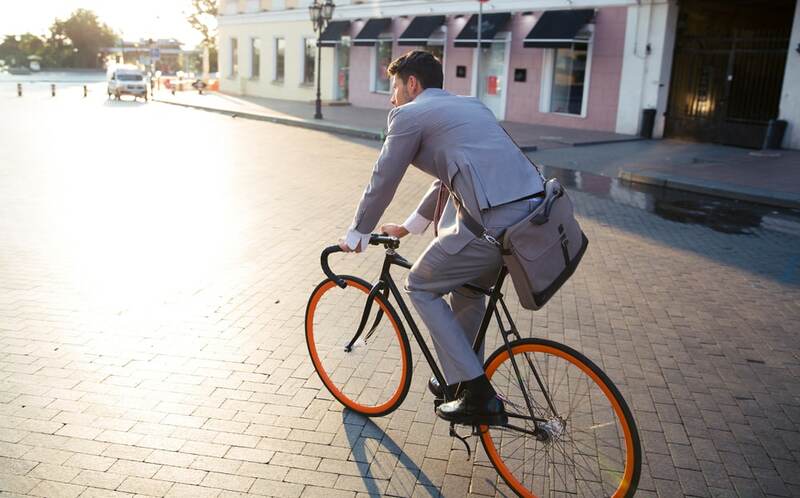 Cycling to work, even once a week, will help lower your chances of ailments such as heart disease, diabetes, and many of the other risks that can come with a sedentary lifestyle. So start with one day a week, and we guarantee you’ll see the light! Our mental health is just as important as our physical health – maybe even more so! That’s why the long morning commute can be a drain on a lot of us. Sitting in traffic drearily waiting to start the day is not always good for our state of mind. Cycling to work, on the other hand, will promote the release of endorphins and help lift your state of mind. Chances are, you’ll never have felt better arriving at work than you will after cycling there. As far as we’re concerned, that’s a pretty good reason to cycle to work. Whether you’re burning fuel, or burning up your Gocard, vehicular transport costs money. It might be much per trip, but it adds up. In fact, chances are you can save money in the long run by purchasing a good quality bike and cycling to work. A good quality bike and a big healthy breakfast is all you need each morning to get yourself to work. And by doing so, you can alleviate a potential financial burden in transport expenses. It’s a win-win, and another of our main reasons to cycle to work. Environmental awareness is higher than ever now, and it means more and more of us are looking for ways to reduce our carbon emissions. Luckily, the answer is sitting in the garage: your bike! Cycling to work uses no fossil fuels; it’s completely carbon neutral and sustainable. Saving the planet: it’s one of our favourite big-picture reasons to cycle to work. And you can enjoy the other benefits as well. If the endorphin rush of cycling isn’t enough for you, why not add a social element? Like an office carpool, cycling to work can be a great social activity. It promotes cohesion in the workplace, sustainable practices, and social connection. And that’s before you’ve even arrived at the office! If these reasons have convinced you to cycle to work, maybe you can convince someone else and both enjoy the advantages. For the best tips and tricks of cycling, get in touch with our team!